Breakfast, brunches, morning meals, call them what you want, they’re all taken very seriously in Bangalore. Whether or not you’re really a morning person, you really should get some food in you before 11 am when you’re in this city. Every day, you’ll find locals enjoying a hearty breakfast at the many restaurants and food stalls in and around the city. Whether it’s traditional food you prefer or a continental selection, a low-cost breakfast or an expensive set meal, we’ve got you covered. 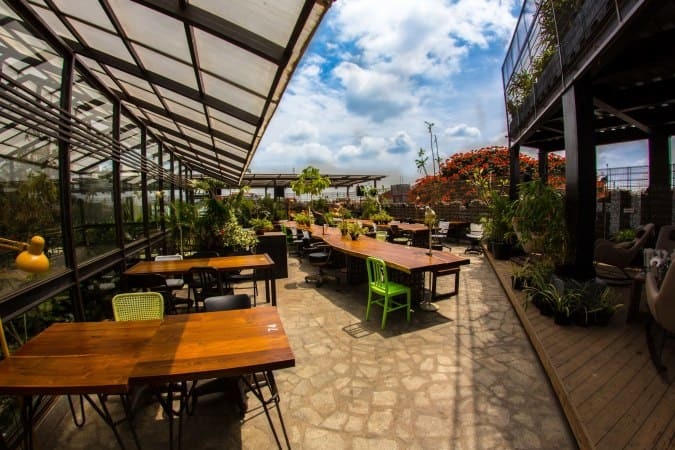 Here are the 14 best places to enjoy breakfast in Bangalore. Average Costs of Breakfast in Bangalore: Joints serving local food will cost you as little as Rs. 70 for a full breakfast, while foreign meals, such as a continental breakfast, could set you back even Rs. 1500 per person. Breakfast Timings: Local fare is available earlier (from 6 am), and through the day. Restaurants serving continental breakfasts typically open past 8 am. On the Weekend: Sunday brunch in Bangalore is very popular. Look out for good offers on the weekend you’re visiting. Located bang opposite the Malleshwaram Railway Station, Sri Raghavendra Stores treats its patrons to fresh varieties of South Indian breakfast items. Here you’ll be treated to South Indian delicacies like idli-vada and shavige bath. The idlis, served with a delicious homemade coconut chutney, are a must try, along with delicious filter coffee. One of the lesser known places in Bangalore, Shivam Snacks Corner is famous for its Maggi. They serve portions of Maggi with different combinations, spices, and ingredients. Here you can try Maggi with chicken, potatoes, cheese, and chili sauce. Although they also offer different rotis and even pav bhaji, the Maggi varieties is why this place is famous. Looking for a quick breakfast? 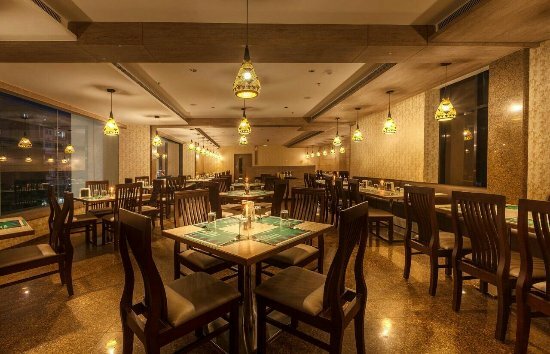 Head to Konark Vegetarian Restaurant, one of the oldest restaurants in Bangalore. Begin your day here with crisp dosas and a variety of sandwiches; later, quench your thirst with the selection of beverages available. Take your pick from tea, coffee, and a variety of milkshakes. If you prefer something lighter, pick from the variety of fresh juices. Location: Three outlets, one at Sree Kanteerava Outdoor Stadium Main Gate, another at Field Marshal Cariappa Road, and a third on Commercial Street. A new kid on the block, South Thindies serves a wide selection of breakfast items. The menu includes the regulars like idlis, dosa, and voda. 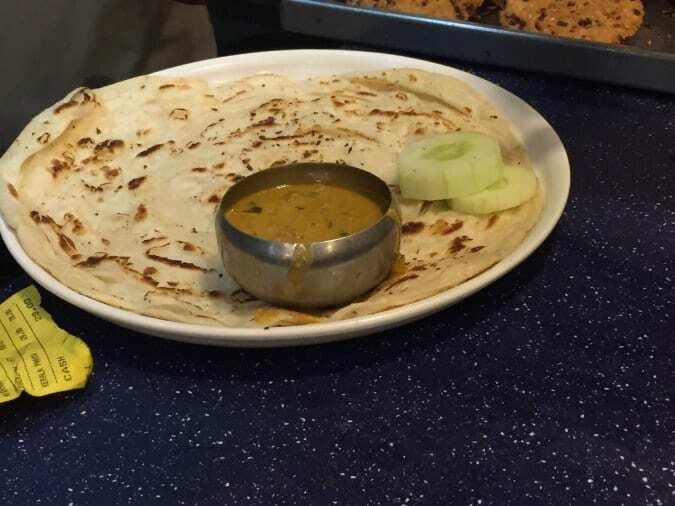 But what you should really try here is the in-house special called the Bread Dosa. It’s a regular dosa made with a twist. They sprinkle bread crumbs on top of the dosa. This adds a yummy crunch to the dish. Other favourites here are the Kerala parotta and the kesari bath. Also worth checking out is the Hall Boy, a surprise we’d rather not tell you about here. On the beverage menu you’ll find kokum sherbet and buttermilk — perfect to wash down a heavy breakfast. 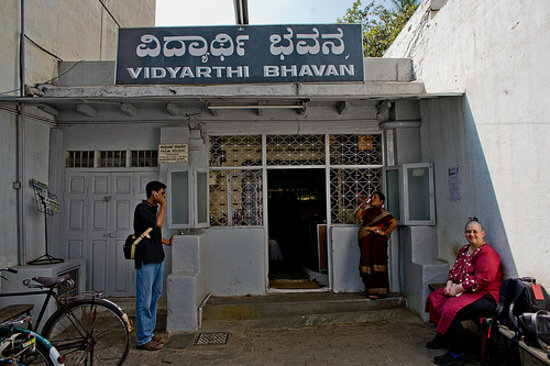 Operational since the 1940s, Vidyarthi Bhavan is the perfect place to begin an exploration of Gandhi Bazaar (where you could spend the whole day shopping). The one dish that is a must try here is the masala dosa. Served the traditional way, with coconut chutney and sambhar, it’s considered to be one of the best in Bangalore. A local adda for many, Airlines is an open air restaurant that’s famous for its breakfast. Packed to capacity on most days, the place serves authentic, delicious, and sumptuous Bangalorean breakfast items. Make sure you try their special vada and the maddur vada. If you love your dosa or vada soaked in sambar, ask for a glass full of sambar (you’ll be left feeling delighted). Other popular breakfast options here are parathas, pav bhaji, baths, and Channa Bathure. Airlines also has a good lunch menu, but, we will talk about that another time. Go here if you love to indulge in unusual cuisines. The place is a meeting spot for uncles who come here to catch up on the daily happenings in the area. You’ll find all of them engaging in frantic conversations on politics, sports, films, and the weather. The food here is unique — you’ll be treat to dishes such as green masala idlis. Don’t go by its colour; this dish really packs a punch with its pudina flavour. If you would rather not experiment, you can stick to the all-time favourites like neer and raagi dosas. 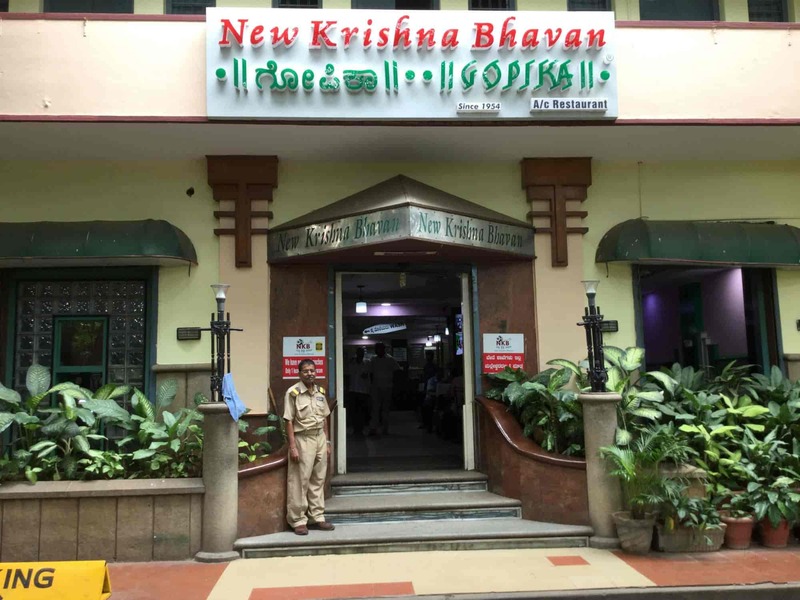 So, if you’re looking for a place to mingle with the locals, get a feel of local happenings and experience the unusual, head to New Krishna Bhavan. Start off your weekend on a great note with a big sumptuous breakfast at Café Myodo. 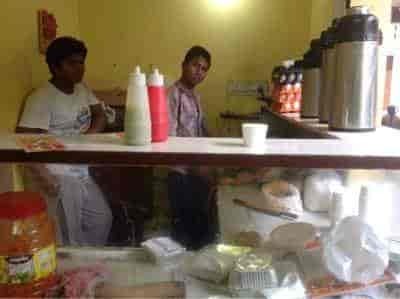 This quaint café in Kalyan Nagar offers you a wide selection of breakfast items all day. You have a good choice of egg preparations (from omelettes to bhurji), muesli, puddings, and even a special Arabic breakfast that comes with pita bread, olives, tomato and other middle-eastern delicacies. But what you should really go here for is the French Toast. This café serves a delicious French Toast that’s served with brûléed bananas and crunchy nuts. If you’re looking for a breakfast that packs a punch, try the Chocolate French Toast that’s loaded with Nutella, Kit-Kat, and cream. You would associate Monkey Bar in Indiranagar with alcohol and live music, but have you ever tried their breakfast? Yes, the place offers a wide range of breakfast items to gorge on. You can add a desi touch to your breakfast. For example, you can add a portion of Goan sausage with your omelette or try the Omelette Xacuti Curry. If you’re looking for a vegetarian desi-videshi combo, try the Paneer Bhurji Bao that’s a steamed Chinese bun stuffed with paneer that’s cooked in a delicious masala. They also have hot favourites like the Breakfast Burger and a Cuban sandwich. And, of course, they do have a good selection of coffees and teas. Average Cost: Rs. 700 for two. Bored of the same old breakfast menus? 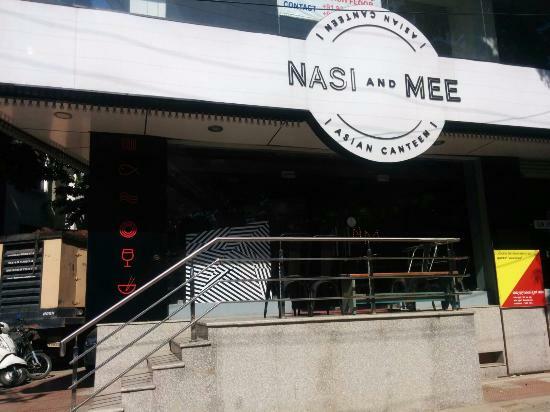 Try something different at Nasi and Mee. The place offers a good selection of South Asian breakfast fare. Take your pick from Singapore Kaya Toast (Singaporean bread served with a delicious in-house coconut spread and eggs). Try the Sambal cheese toast that’s loaded with parm, arugula, and spiced tomatoes. If you love to have a big breakfast, sample on the N & M Big Breakfast that comprises sausages, eggs, and Kaya Toast. And you have to try the Malaysian version of tea, called Kopitiam Teh Tari. If you are the kind of person for whom a big breakfast is a must then you’ll love this place. They serve a variety of breakfast platters here and all of them pack a punch. You can pick the traditional English Breakfast that comes with eggs, sides (bacon & sausage), mashed potatoes, and bread. If you love to try new things, try The Goan Sausage Fest that comes with a spicy Goan sausage, eggs, and bread. One of the most popular breakfast items on the menu here is The Chicken Hole 9 Yard Hash, a traditional American breakfast served with eggs, ham, salami, sausage, and hash browns. If you’re going here with someone who loves a light breakfast, they too will be happy as they can try one of the pancakes and waffles available here. Location: 8th Main Road, Koramangala 4th Block. Must Eat: Any of their set breakfasts, Grape Juice, Pancakes. A Bangalore institution, Koshy’s has been serving breakfast to one and all for several decades. While its lunch menu spans several cuisines, from English to North Indian, it keeps breakfast simple. Offering eggs done in a variety of ways, and a few readymade items such as cutlets and sandwiches, the food here is very reasonably priced. This is one reason it sees crowds at all times of the day, seven days a week. Head over here when you want to experience Bangalore in its cosmopolitan glory. The Social outlets in Bangalore are very popular for their breakfast trays that are a desi take on international cuisines. Try their Hardy Bhai’s Istyle breakfast tray, which comes with mince and eggs, a bun, tea, and biscuits. For those who love their meats, the Saddlebags are a must try; they come with sausage, bacon, maple syrup, and fried eggs. 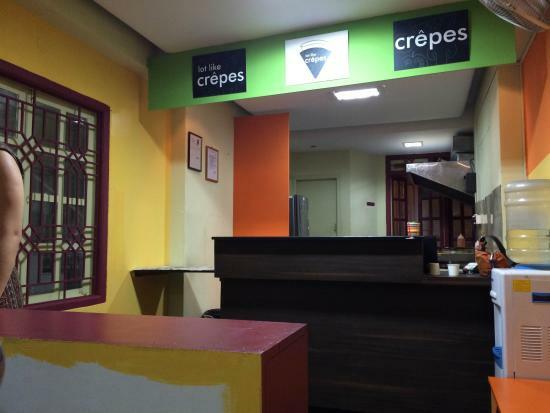 Lot Like Crepes is one place that breakfast lovers have to try in Bangalore. The menu is divided into two sections: sweet and savoury. What you should really try here is the special crepes like the Sticky Toffee with Kiwi Or Banana. During the strawberry season, do try the Spicy Chocho With Strawberry Crepe. This was our list of the best places to eat breakfast in Bangalore. As you can see from our list, Bangalore has no dearth of options for breakfast. Whether you’re looking for local delicacies or craving for a big English or American breakfast, you can try them all in Bangalore. So, the next time you’re in the city, check out these places and tell us about your experience; we’d love to hear from you in the comments section below.